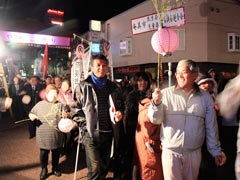 In the evening of December 25, people marched throughout Amami City with lanterns to commemorate the 60th anniversary of Amami Island's reversion to Japanese administration. On December 25, the Amami City Memorial Event Executive Committee commemorated the 60th anniversary of the reversion of the Amami Islands to Japanese administration. There were speeches by youth groups from each region and performances by artists from Amami such as Chitose Hajime and Kosuke Atari. The people who gathered at Naze Elementary School in Amami City, Kagoshima Prefecture cast their minds back to the efforts of those who contributed to the island’s reversion. According to the organizers, around 3,000 people gathered for the event on Amami Oshima, which has a population of 65,000.